Sep. 25, 2014 10:00 p.m. Nomination documents, requirements, procedures, and related information for prospective candidates, are now available in Legislative Services, Civic Facility, 20338 â€“ 65 Avenue, Langley, BC. The Township of Langley uses the Provincial Voters List for its List of Registered Electors. Residents can check to see if they are on the List of Registered Electors at Voter List Lookup. If you are not on the Township of Langleyâ€™s List of Registered Electors, you may register in person on the day you vote. not disqualified from voting in an election. if there is more than one registered owner of the property, only one of those individuals may, with the written consent of the majority of the owners, register as a non-resident property elector. If one of the owners of the property is a limited company, the property does not qualify. The List of Registered Electors is available for public inspection from Tuesday, September 30, 2014 until the close of voting on general voting day on November 15, 2014 at Legislative Services, Township of Langley, 20338 â€“ 65 Avenue, Langley, BC, 8:30am to 4:30pm, Monday to Friday, except statutory holidays. An elector may request that personal information respecting the elector be omitted from or obscured on the List of Registered electors. On request, the Chief Election Officer will amend the list available to the public by omitting or obscuring the address of the elector or other information about the elector. Objections to the registration of a person whose name appears on the List of Registered Electors must be received in writing before 4:00pm on Friday, October 10, 2014. An objection may only be made by a person entitled to be registered as an elector of the Township of Langley and can only be made on the basis that the person whose name appears has died or is not qualified to be registered as an elector in the Township of Langley. 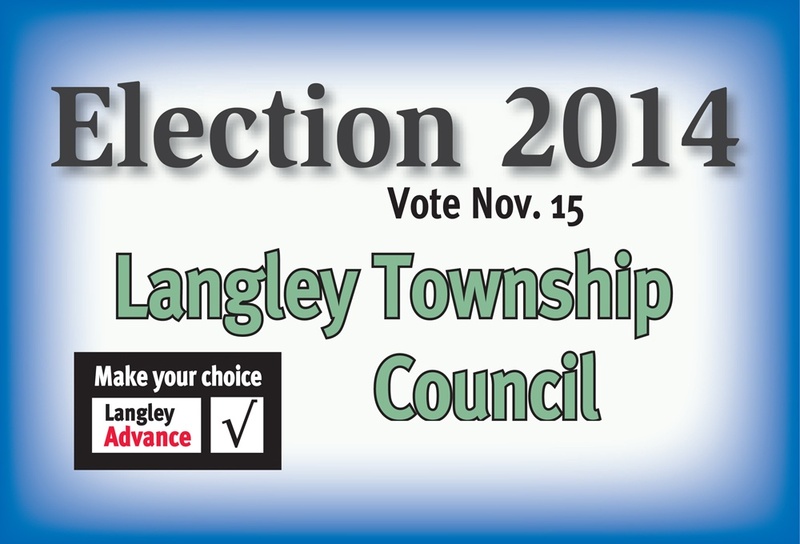 Candidates are not permitted under the Township of Langley Bylaws to erect election signs outside buildings or on properties before Sunday, October 26, 2014 and all election signs are required to be removed by 4:30pm, Wednesday, November 19, 2014. Township Bylaws No. 4402 (Sign Bylaw) and No. 4840 (Highway and Traffic Control Bylaw) regulate the erection of election signs on private and public property. Neither the Township of Langley nor School District No. 35 permit the use of its logos, heraldic emblems or similar corporate identifiers for the purpose of any candidateâ€™s campaign activities.